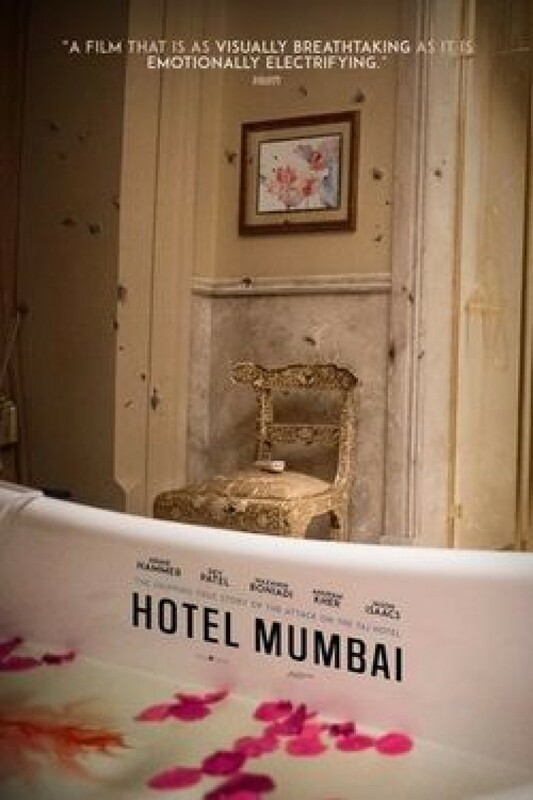 Dev Patel (left) as ’Arjun’ and Anupam Kher (right) as ’Oberoi’ in director Anthony Maras’ HOTEL MUMBAI, a Bleecker Street release. An Indian man who’s risked his life helping to save wealthy guests at the posh hotel where he works as head chef (Anupam Kher‘s Oberoi) is imploring a group dead-set on venturing into bullet-riddled hallways to remain in the exclusive (and therefore hard to enter) club chambers where they currently reside. When they force his hand to let them go, he offers them prayers. We don’t know anything about this man besides his selflessness and courage—especially not his religion. But what does he receive in response from a Russian womanizer (Jason Isaacs‘ Vasili) who may or may not have a military background? “Prayers are how we got here.” A Catholic looks at nothing but the color of his protector’s skin and lumps him in with the terrorists. Does director Anthony Maras and co-writer John Collee provide context to this exchange? Do they let anyone put Vasili in his place or educate him like they do the scared white woman who vocalizes her fear towards the beard and Sheikh dastaar (“turban”) on another such Indian hero (Dev Patel‘s Arjun)? No. They let that hate float there unchecked before ultimately doing their best to turn this Russian into a heroic figure himself and thus dismiss his gross personality traits under the catch-all of “complicated.” It doesn’t matter that Islam is the second most practiced religion in India with the highest growth point—Hotel Mumbai has no sympathy for the inevitable backlash Muslim citizens face in the country where this horrific attack (by Pakistani imports) occurred in 2008. It’s too busy presenting our stand-ins—a collection of Caucasians on holiday—as the ones in impending danger. So just like the terrorists who orchestrated this coordinated assault on behalf of “Brother Bull” (who has still yet to be captured) treated the Indians as expendable pawns on their quest to take hostages with more international currency, the film consistently lets its brown-skinned innocents get mercilessly mowed down as unwitting diversions whenever a foreigner deems it necessary to travel this warzone with self-serving intent. 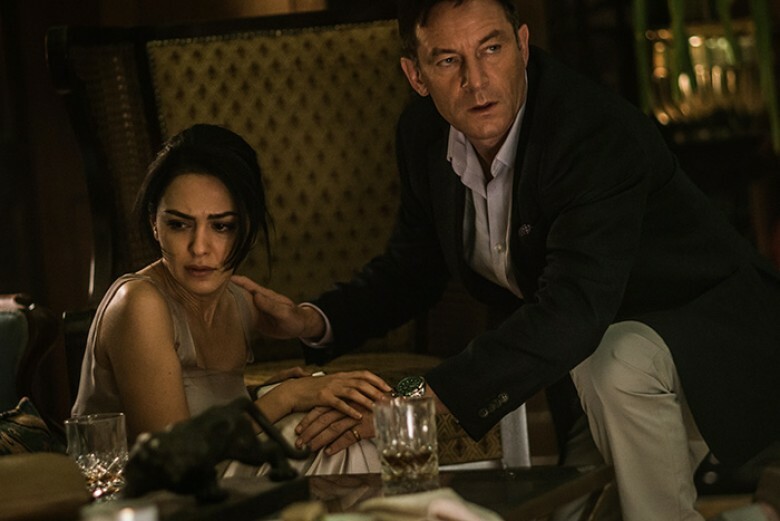 Whether or not everything on-screen happened exactly the way Maras’ depicts must become secondary to the prevalent fear-mongering those optics manufacture. He very clearly presents his narrative as “us versus them” without regard to how it will vilify “them” for reasons other than their actions. That invisible editorializing renders the whole endeavor dangerous because it ends up working so diligently to acquit tourists, a potential Russian war criminal, and Sheikhs that it forgets to take a step back and also humanize Muslims as a people who exist beyond the antagonistic façade of these impressionable monsters with automatic weapons and a lack of remorse murdering them. Instead we get a couple scenes where one of the terrorists (Amandeep Singh‘s Imran) questions whether or his cell leader has duped him into participating in a nightmare Allah doesn’t actually condone. These moments only hurt the depiction more because it shows Muslims as blind zealots following a cause they don’t truly believe in. They’ve simply been bought and thus their religion rendered a deception rather than scripture. Maras and Collee’s script goes even further to separate the “good” brown from the “bad” brown. You can almost forgive the scene where Arjun’s intrinsic selflessness has him kowtowing to an old lady by willingly offering to remove his dastaar as a sign of good faith to assuage her racism because it’s a lesson that many audience members surely need to also witness. The contrast that can’t be forgiven, however, is the flippant use of food in assisting to create this divide. 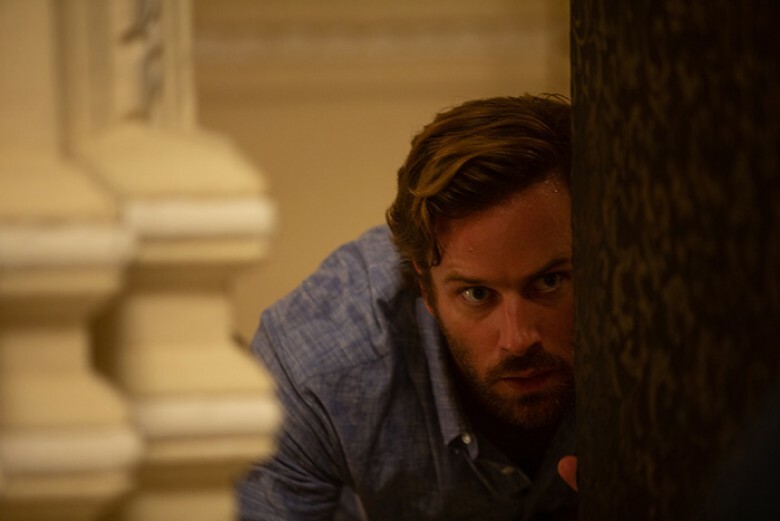 When an American (Armie Hammer‘s David) requests beef for dinner, he apologizes profusely to Arjun for being ignorant to Hinduism’s sacred beliefs. When a terrorist thinks he’s eaten pork, it becomes a joke to spit it out. One religion is bestowed with reverie, the other mocked. And here’s the thing: you don’t have to do any of it. The filmmakers never delve deeper into the terrorists’ motivations than ensuring we know them to be evil, so why keep going back to them as though they should have equal narrative footing with the victims? I can’t think of any reason other than the desire to drive home the point of their religion. They probably didn’t intend to do this when adapting the events, but that’s exactly what they’ve done nonetheless. Because it’s one thing to want to show the psychopathy of killers and their remorselessness, but a complete other to do so while also waving your hands wildly to make sure you have your audience’s attention as far as the reductive “Why?” of it all. You’re allowed to keep them an amorphous villain and focus on the heroism that didn’t quit despite the incursion’s length instead. The epilogue text may explain how half the dead were hotel employees trying to save guests, but the film actually doesn’t focus on them enough to warrant that sudden admission of intent. Arjun is the big exception with Patel stealing the show as a compassionate soul putting his own life in peril to rescue innocents (white and brown alike). Oberoi is another even if the script doesn’t do him many favors by positioning him as the voice of reason many ignore as being “too safe” in their manic states. Outside of them the camera merely focuses on the entitled tourists doing more harm than good. Do we care about Hammer’s David, his wife Zahra (Nazanin Boniadi), and their newborn’s nanny (Tilda Cobham-Hervey‘s Sally)? No. If anything we can’t help but call them stupid as they make the worst decisions imaginable within what quickly devolves from docudrama to survival thriller. The cost of their hero-complexes is more employees and guests who just happen to be seen by the terrorists first. Where Arjun and Oberoi always deem others paramount, this family is entirely motivated by themselves. And that’s fine if they are relegated as supporting players because they’re probably based on real people scared out of their minds. Positioning them as one of three main prongs to this triangle (with the terrorists and Arjun/Oberoi), however, begs us to condone their actions as noble. It ultimately doesn’t matter how good the production value, aesthetics, or performances are when the only thing you think about after exiting the theater is how many boomers will return home nodding their heads because their xenophobia was reinforced. Will they pause next time they see a Sheikh? Probably not since their view of brown and turbaned as ISIS will always conjure a shoot first, ask questions later mindset that never gives Arjun a chance to explain himself. The goal should be to make this world a place where knee-jerk fears aren’t prevalent and the victims being positioned to have to explain themselves to the affluent and white more so. Hotel Mumbai tries so hard to separate Indian from Lashkar-e-Taiba that it forgets to separate out Islam too.